There have been better times for full-size sport utility vehicles. Faced with rising gas prices, eco-protests and nervous insurance underwriters, some shoppers have turned elsewhere in their search for family-size transport. But for others, nothing can take the place of a large, powerful and roomy SUV, especially those who need to tow and haul. It's for these faithful that GMC intends the mostly all-new 2007 Yukon and Yukon Denali. Inside, everything's new. Seats are lighter, more comfortable. The dash is seriously simplified, with major reductions in confusing knobs, buttons and displays. The interior styling is refreshingly elegant, hinting at aspirations for entry-luxury status. An equally new exterior wraps around that delightful interior. The re-styled front end remains true to the GMC trademark shapes and geometric but with a thoroughly modern flavor. Sides shorn of overbearing cladding add lightness to an otherwise fairly substantial presence. Optional, 20-inch polished wheels add a touch of high fashion trendiness. The 2007 Yukon is three inches longer than last year's model, nearly all of which goes to added front seat legroom and cargo area, but the wheelbase is the same length. The popular 5.3-liter V8 engine gets a moderate boost in power and, perhaps more important, an ingenious system that shuts down half the cylinders under light load, improving fuel economy by one or two miles per gallon. The base 4.8-liter V8 gets a slight boost in power, too. At the top of the line, the luxurious Yukon Denali boasts a new 6.2-liter V8 generating 380 horsepower with a new six-speed automatic. The Yukon seats six to nine passengers and is rated to tow up to 7700 pounds when properly equipped, enough to tow cars, boats and horses. All in all, a nice package and a real leap forward from the previous generation. Adding to the appeal, starting MSRP for the 2007 Yukon is more than $3000 less than the comparable 2006 Yukon, itself re-priced in the fall of 2005 as part of GM's Value Pricing initiative. The 2007 GMC Yukon lineup offers a choice of three different V8 engines and a choice of two-wheel drive or four-wheel drive except the Yukon Denali, which comes with all-wheel drive. 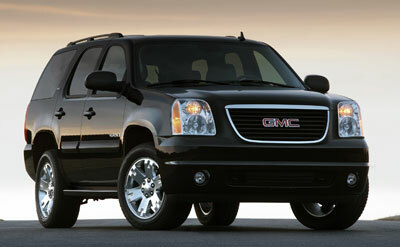 The standard GMC Yukon comes with a 290-hp 4.8-liter V8 and four-speed automatic. The 4.8-liter engine is not part of the initial launch, however. Once it's available, we expect the Yukon will be available at a lower base price. The Yukon SLE 2WD ($33,815) and 4WD ($37,615) come with the 320-hp 5.3-liter V8 with Active Fuel Management and four-speed automatic. Also available is the 5.3-liter V8 with AFM and E85 Flex-Fuel capability. Standard equipment includes cruise control; multi-zone air conditioning front and rear; AM/FM/CD/MP3, eight-speaker stereo; driver information center; the usual powered features, with the outside mirrors heated and foldable; a six-way, power driver's seat; leather-wrapped, tilt steering wheel; cloth upholstery; 40/20/40 split front bench seat with manual recliners; 60/40 split folding second row bench seat; roof rails; locking rear differential; 17-inch, bright aluminum wheels; and three power outlets. A second-tier SLE 2WD ($35,565) and 4WD ($38,365) adds foglamps, steering wheel-mounted audio and cruise controls, rear-seat audio controls and outputs and cargo cover and mat; replaces the front bench seat with a pair of buckets and a center console; and upgrades the stereo speakers to a nine-speaker-with-subwoofer, Bose Premium system. The uplevel Yukon SLT 2WD ($37,995) and 4WD ($40,795) are available with either of the 5.3-liter V8s, both fitted with the four-speed automatic. In addition to or in place of similar features on the SLE, the SLT gets automatic climate control; power adjustable pedals; front tow hooks; leather-trimmed, bucket front seats; leather-appointed, 60/40 split, second row bench seat; six-disc CD changer; rear seat audio controls and outputs; programmable remote garage opener; and remote start. There's also a second-tier SLT 2WD ($40,060) and 4WD ($42,860) that add roof rack cross bars; outside mirrors upgraded with integrated turn signals, ground illumination, reverse-tilting and driver-side auto dimming; heated, 12-way power driver and six-way power front passenger seats with two-setting driver side memory; vinyl-covered, 50/50 split, two-passenger, third-row bench seat; and XM Satellite Radio. Yukons offer extensive lists of options, both free standing and in packages. Popular packages include two navigation systems, one of which incorporates a DVD capability ($2145); and the rear seat entertainment system ($1295); and the power liftgate ($350). The third-row seat comes in two forms: two-passenger and a three-passenger. Options include XM Satellite Radio ($199), power adjustable pedals ($120), power sunroof ($995), roof rack cross bars ($45), power release for the curb-side second row seat ($425), heated second-row seats ($200), rain-sensing windshield wipers ($95), 20-inch wheels ($1795), front fog lamps ($140), six-disc CD changer stereo upgrade ($300), remote starter ($175) and retractable cargo cover ($70). Finally, by way of cold weather, towing and off-road options, but again only on some models, buyers can order one of two lower rear axle ratios ($100), an engine block heater ($50), a heavy duty transmission oil cooler ($95), a windshield washer fluid heater ($85), an off-road skid plate ($125), and Autoride suspension with variable shocks and air-assisted real load leveling ($1120). Designers can do interesting things with styling cues, and with the 2007 GMC Yukon, they've managed to make a vehicle that's larger than its predecessor look smaller, more compact, and definitely more svelte. Stripping off excessive cladding and overly decorative brightwork and ironing out tired body ripples combine to transform the looks of the Yukon and Yukon Denali. Although the 2007 models are nearly three inches longer than their predecessors, the quieter, calmer surface planes diminish the perception of that extended length. Likewise, the smooth, gently contoured flanks and arrow-straight beltline visually lower the height. Remarkably tight tolerances between body panels invite comparisons with the highest quality imports. The one-piece, softer-look front end presents a friendlier, more welcoming face but without forfeiting the Yukon's presence. Large headlight housings promise good vision. The trademark grille and lower air intake ensure good breathing. A more sharply raked windshield eases movement through the air. Tall, symmetrical side glass fits flush with surrounding body panels. Door handles bridging deep recesses make for easy gripping in all seasons. Squared-off wheel wells carry forward a Yukon signature styling cue but, frankly, yearn for larger wheels and more substantial rubber. Save on the Yukon Denali, that is, which rides on 20-inch, chromed aluminum wheels wearing low profile, blackwall tires. As inspired as the Yukon's overall new look is, the back end is decidedly less so. Then again, a family vehicle that has to accommodate up to nine people and haul their cargo doesn't leave stylists much leeway for creativity. Thus, the broad, mostly flat, almost vertical tailgate in between tall, narrow taillights. The independently hinged rear window is a nice touch, permitting easy loading of grocery bags and such. While the exterior design of the new Yukon is a great leap forward, the remake of the interior borders on revolutionary. Just by the measure of how many buttons and knobs there aren't, the '07 Yukon reflects a radical re-thinking by the people in charge of deciding how occupants will relate to their immediate surroundings. Topping the list is the re-positioning of the dash. Lowered by half a foot, re-contoured and elegantly simplified, the new instrument panel and center stack would look right at home in 'most any luxury SUV. In fact, we think it's a friendlier, slicker and more integrated assemblage of gauges, display screens, touch pads and control panels than those in either the Range Rover or the new Mercedes-Benz GL450, both priced substantially higher than the Yukon models, including the Denali. The gauge cluster is more informative, reporting via secondary analog dials powertrain data many others leave to warning lights or bury in scrollable information displays. The fit between panels and coverings is impressive, with tight tolerances. Leather surfaces feel expensive, if not luxurious. Less impressive is the finish of some of the hard plastic surfaces, which look better than they feel. The headliner is a woven fabric that looks and feels like mouse fur. The design of the dash gives the driver an expansive view out the windshield, adding to the feeling of being above it all. Visibility is good all around, although the imposing C-pillar (the post between the rear side door and the rear quarter panel,) does nothing to reduce the large side mirrors' blind spot. Along the same lines, the third row seat blocks the lower third of the rear window; folding the third row down eliminates this. The redesigned seats are refreshing. The seat belts are mounted to the B-pillar, a nice improvement over the awkward seat-mounted belts used on previous models. The design of the new belts should also offer improved occupant protection. This yields lighter, less bulky seats that are more comfortable and easier to adjust. Thigh support, a common deficiency in GM vehicles, is good in the front seats and second-row Captain's chairs. We're disappointed with the folding armrests, however; they have one setting, which won't fit every occupant. Some way to adjust the angle of these armrests would be welcome. Room for people is respectable and competitive with other full-size SUVs. In all but the second-row seats, there's more headroom, legroom and hiproom than in the 2006 Yukon, and the shortfalls in the second-row seat are measured in fractions of an inch. Comparisons with the 2006 Ford Expedition, Nissan Armada and Toyota Sequoia are mixed. In the front seat, the 2007 Yukon bests the Expedition and the Armada by several inches in all three dimensions, while equaling the Sequoia in headroom and bettering it in the other two. In the second row, the new Yukon trails the Expedition in headroom and legroom and betters it in hiproom, but by less than an inch in all regards; the same holds for the Armada, again in all three measures; and the Sequoia tops it in headroom but comes up short in legroom and hiproom. As for second-row access, the new Yukon still suffers from small-feet syndrome, where the clearance between the base of the second row seat and the doorframe is so cramped, it's impossible to step in or out without turning your feet sideways. When it comes to trucks, numbers matter, arguably more than they do with cars. The most popular engine for the GMC Yukon is the 5.3-liter V8, which produces 320 horsepower and 340 pound-feet of torque. Our test Yukon was listed at 5537 pounds. Examining these numbers should give a good idea of how a 5.3-liter Yukon will perform against the competition. By comparison, the 2006 Ford Expedition puts up a 5.4-liter V8 making 300 hp and 265 lb.-ft. of torque with a six-speed automatic and tips the scales at 5805 pounds. The 2006 Nissan Armada's 5.6-liter V8 makes 305 hp and 385 lb.-ft. of torque, mates to a five-speed automatic and carries a curb weight of 5623 pounds. Toyota's 2006 Sequoia comes with a 4.7-liter V8 making 273 hp and 314 lb.-ft. of torque with a five-speed automatic and weighs 5025 pounds. Note, however, that the Yukon's 5.3-liter engine comes with a four-speed automatic transmission, while many full-size SUVs now come with five-, six-, and seven-speed automatics. More gears generally means smoother operation, better fuel economy, quicker acceleration performance or all three. The Yukon's four-speed automatic negates any power advantage the Yukon might otherwise have enjoyed at least as far as outright acceleration is concerned. Put another way, while it'll easily hold its own on the interstates, the Yukon isn't going to win many stoplight grands prix. Not so, though, the Yukon Denali, which would leave its lesser sibling and all the others in the dust were its driver so inclined. The Denali packs a 380-hp 6.2-liter V8 and six-speed automatic. Fuel economy is a much better story for the new Yukon. The 2WD and 4WD versions each earn an EPA combined City/Highway estimate of 18 mpg. That's not exactly Toyota Prius territory, but the Yukon's Active Fuel Management system, which shuts down half of the engine's cylinders under light load, puts the 2007 Yukon at head of the class in the fuel economy competition. Both the 2WD and 4WD Yukons best all of the competition in EPA Highway estimates by as much as four miles per gallon. In towing, the Yukon's 7700-pound rating beats the Toyota's 6500-pound rating, while Ford and Nissan rate their entries at a maximum of 9100 pounds. From the driver's seat, much of this is not noticed. Power comes on smoothly, with no surges or hiccups and accompanied by a pleasant, dual exhaust-like tone. Transitions effected by the fuel-management system are invisible, with the only indication a telltale in the information display in the tachometer. The four-speed automatic selects gears with little fanfare. The six-speed automatic in the Yukon Denali is even smoother; the new six-speed automatic also has a manual shift function managed by a rocker switch in the handgrip on the column shift lever. While trucking along twisty, two-lane roads in Georgia and on coastal California roads, the Yukon tracked flat and smooth through 70-mph sweepers marked with 40-mph advisories. The ride was comfortable and controlled on South Carolina freeways, both glass-smooth and buckled from severe winters. For this, credit the rack and pinion steering, which is new for 2007, that delivers sharper, more precise turn in, along with a stronger and stiffer frame; new, coil-over-shock independent front suspension; revised, multi-link, live axle rear suspension; and a wider track, by some three inches in front and an inch in the rear. The turning circle impressed us. It takes less space to make a U-turn in a Yukon than it does in other SUVs in this class; even some relatively small vehicles such as the Mitsubishi Eclipse need more space to turn around than the new Yukon. This is helpful in a world of big SUVs and compact parking spaces. The 2007 GMC Yukon has an astonishingly fresh and comfortable interior. Its sleek, new body is mounted on a new, stronger and stiffer frame and there's also a new power steering system, beefed up brakes, new front suspension and re-worked rear suspension. It's easily the best Yukon we've ever driven. With all these improvements, the Yukon is now a strong contender with other full-size SUVs. Head/hip/leg room, f: 41.1/64.4/44.1 in. Head/hip/leg room, m: 39.2/60.6/39 in. Head/hip/leg room, r: 37.9/49.1/25.6 in. Cargo volume: 108.9 cu. ft.